I went to visit my parent's this weekend for Mother's Day. While there, they pointed out four dead sour cherry trees that they wanted pulled up. We've had great luck with fruit trees in our yard, but these may have been crowded out by bigger trees and died. Two of the trees were in a very shadowy area, where a row of pine and a large apple tree blotched out most of the light, resulting in damp, mossy soil. 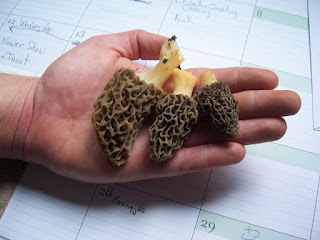 It was here that I found three wild morel mushrooms! My mom has seen them sporadically for 6-7 springs, ever since we got a load of mushroom mulch from a gardening center. I suppose some of the spores were still active and found productive places in our yard. While I've never "foraged" for mushrooms before, I've read a great deal about it. Morels are considered one of the best mushrooms for novices to pick, as there's nothing poisonous that resembles their distinctive honeycomb top. At least in North America. Surprisingly, the most common case of mushroom poisoning in the U.S. is of East Asian-nationals who mistake the incredibly poisonous Death Cap mushroom for the edible Paddy Straw mushroom that grows in abundance across south east/eastern Asia. Doom and gloom aside, these mushrooms were wonderfully tasty, earth, and non-toxic. 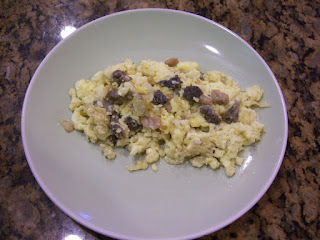 I wish there were more of them, but they still made enough for a tasty breakfast of eggs and morels. Nice find! I have yet to taste a morel.